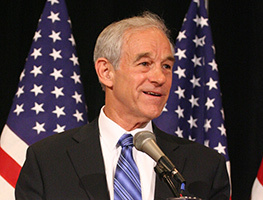 Ron Paul has been the leading spokesman for limited constitutional government, low taxes, free markets, and a return to sound monetary policies based on commodity-backed currency. Ron Paul was known among both his colleagues in Congress and his constituents for his consistent voting record in the House of Representatives: Dr. Paul never voted for legislation unless the proposed measure is expressly authorized by the Constitution. In fact, he possessed a consistent conservative record of standing up for the Constitution, even when it means voting alone. Never voted to raise the federal debt limit. End the IRS and the income tax. Stop the central bankers’ “Inflation Tax” and save the dollar. Stop the spread of socialist, Big Government health care and instead work to repeal the “ObamaCare” monstrosity. Stop the growth of government spending, restrictive regulations, and interference in our lives. Ensure the federal government returns to its constitutional limits by eliminating departments and agencies that are not authorized by the Constitution. Return to the Founders’ more humble foreign policy. American troops and taxpayers deserve better than to be used for “nation-building” or policing the world. Because of his steadfast support of the troops, Ron Paul receives more donations from active duty military than all of his Republican opponents combined!